I am a graduate student in the Losos Lab at Harvard University, where I am studying patterns of evolution in island and mainland Anolis lizards. My interests range from ecology to physiology to conservation and beyond, but all within the context of my true love, herpetology. I grew up in Colorado and attended Barnard College in New York City, where I completed a senior thesis on honey bee gut immune mechanisms. 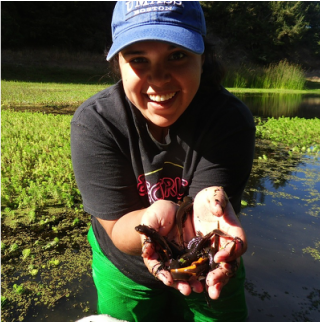 For my Master's degree at San Francisco State University I explored the host-microbiome relationship in Ensatina salamanders. I have also worked on several projects involving Anolis lizards, addressing questions of thermal biology, evolution, and behavior. For more info, please see my Research page.